Your outdoor space serves a lot of functions. Not can it become an extra room for your home, it provides storage space, and creates a barrier between your home and the world at large. At least it should. In this article we’re going to look at some of the ways you can increase home security by using landscaping. But first, you need to be careful about who you ask for help….. The most obvious (at least to me) step to take when landscaping for security is to choose your suppliers wisely. TV programs like “Rogue Traders” have highlighted the dangers of asking for help from the wrong people. Can you be sure that the person who turfed your garden for a reasonable price, won’t come back whilst you’re out? Armed with information about your garden, your security arrangements and the contents of your garage it wouldn’t take long for him (or her) to remove your precious items. Before inviting any sort of tradesman on to your property you must satisfy yourself that they are trustworthy. Before you even think about consulting a landscaper about security, make sure the Company has a good reputation, a registered office and has been approved by Trustmark or some similar organisation. Protect yourself. So how can you use landscaping to protect your property? First of all, don’t confuse Landscaping with Gardening. They are closely connected but they’re not exactly the same. Gardening is mainly about nurturing plants. It’s about trees, flowers, natural lawns, soil and mulches. I absolutely love it and so does my Dad Chris. However we both understand that garden upkeep isn’t for everyone. But, for those who are not inclined, too busy or otherwise unable to tend a garden, landscaping can make their outdoor spaces beautiful, practical and secure. It adds value to the property without making it high maintenance. This driveway in Sudbury, Suffolk does have some easy-care planting for interest but also has some security-enhancing features. It has a strong fence that hides the house from the main road, open views with nowhere for burglars to hide, lighting and a gravel surface that is impossible to walk on without making a noise. For a homeowner who is really averse to gardening, the planted areas could be redesigned with really low maintenace materials. Landscaping for security makes it harder for people to enter your property uninvited. It keeps valuable items hidden away from temptation. And if anyone does break into your garden, landscaping for security tries to make sure they are seen or heard before they get up to mischief. Nobody want’s their home or commercial premises to look like a fortress. However, careful landscape design can really increase security without making the place seem unwelcoming. Our design partners, Tapestry Design Studios can help you to choose and place features so that they create an inviting space AND deter burglars. Both at the same time. For example, having plenty of clear space gives burglars fewer places to hide and affords excellent views for CCTV cameras. Uncluttered though, needn’t mean boring or bare. There are plenty of things you can do to add interest. Such as mixing and matching surfaces, adding seating areas, and strategically placing larger features. Siting summerhouses, pergolas and sheds carefully allows you to place CCTV cameras and security lighting to its best effect. Using screens or fencing that can’t be climbed is of course a great help. Try to source beautifully designed structures to hide the wheelie bin and mark the boundary with real style. Better still, include some craftsman-built bespoke features that truly express your own identity. We’ve talked about fences and lighting but what about surfaces? 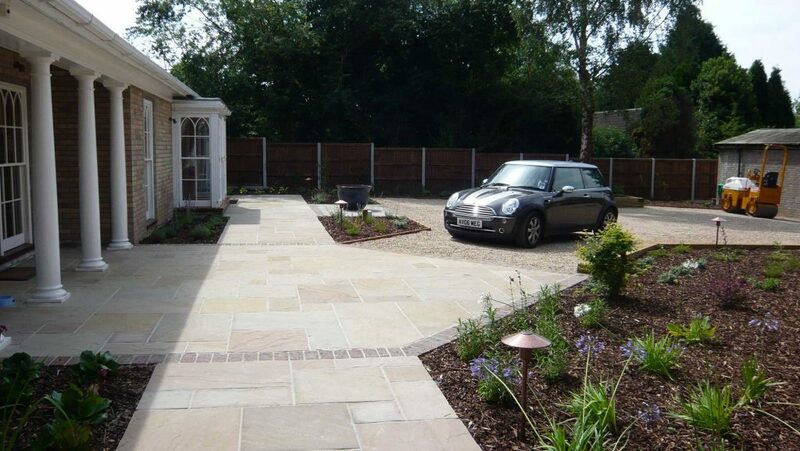 According to Essex Police, burglars are deterred by gravel surfaces because they make a noise when they’re walked on. 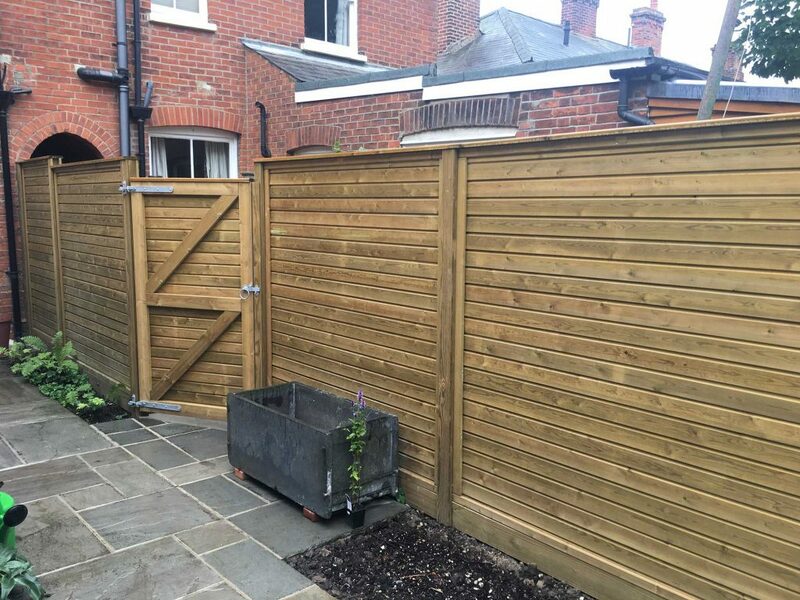 At Holland Landscapes, we also have a few trade secrets and tricks up our sleeves to help make your garden secure. Clever landscape design can help you to store valuable outdoor items safely. Things like ladders are a pain to stow away but they’re enormously helpful to a burglar who wants to climb through an upstairs window. A well thought out and well-built garden can discreetly mix secure storage with optimum style. For example, hidden compartments inside a garden office or a raised deck with storage space beneath it. I have two dogs and I honestly don’t know what I’d do if anybody took them from my garden. Imagine not knowing where they are, who they’re with, whether or not they’re safe. I’d be heartbroken and so would everybody in the family. My garden boundaries are designed so that the dogs can (theoretically) be kept safe. The dogs can play in the garden but they are sectioned off so that they can’t be seen by passers-by. It’s not possible to open the gates from outside the garden and the boundary fence has a row of prickly bushes planted behind it. So if anyone is agile enough to climb over they’ll have a very uncomfortable landing. We also have security lighting, CCTV and alarmed padlocks. Our two don’t live in a kennel, but if you have outdoor dogs we can help you add landscaping features to keep them safe. If you are a dog owner, strong, well maintained fencing is vital. Make sure gates cannot be opened from the outside. I contacted Essex Police before I started writing this blog, to see if they have any advice on household security. They actually have a dedicated web page which is well worth a read. One thing to bear in mind is that you – the householder- are legally responsible for the safety of anybody on your property. Even unwanted visitors. If you are at all unsure – it’s always best to contact your local community police officers for advice before you start work.